There are many advantages of allowing Orange County CyberKnife and Radiation Oncology Center to treat your lung cancer. Our outpatient facility in Southern California is home to a variety of radiation treatment options and we employ some of the most highly trained and skilled radiation oncologists in the country to manage and execute those treatment options. Using the experience they have, our experts can prepare a treatment plan that is best based on your specific case. For lung cancer, that treatment plan often includes the CyberKnife Robotic Radiosurgery System, either alone or in conjunction with other treatments like surgery or chemotherapy. This system is built to deliver high doses of radiation precisely to your tumor and kill the cancerous cells. Studies show that CyberKnife is more effective than surgery at treating early stage lung cancer. Effective use of radiation in treating lung tumors is made difficult by the fact that they can move up to two inches as you breathe normally. Because of this, traditional radiation treatments must set a wider path for the radiation to account for the tumor’s natural movement. But the CyberKnife is different. It combines a flexible, robotic arm with state-of-the-art imaging system to track the movement of your tumor and adjust the arm and beams of radiation at hundreds of angles to its exact location even as you breathe. This precision reduces negative impact to any surrounding tissue or organs and insures maximum exposure to the cancerous cells. It is the most precise radiation treatment available and it provides treatment without invasive surgery, within a week’s time and with minimal side effects. Our Orange County treatment team can work closely with your medical team to use the CyberKnife system for stand alone treatment as well as for treatment that complements other options including surgery and/or chemotherapy. The non-surgical CyberKnife treatment is given at our comfortable Southern California treatment center located in Fountain Valley, California. You will be welcomed to our offices for treatment planning, treatment sessions, and post-treatment follow-up appointments. The first step is for our skilled Orange County radiation oncologists to meet with your team of doctors which may also include an oncologist, a pulmonologist, a thoracic surgeon, a medical physicist, and medical support staff. You will be asked to visit the office for an examination of existing tests and data so that doctors can find out the exact location and size of your lung tumor and determine its specific characteristics and treatment needs. 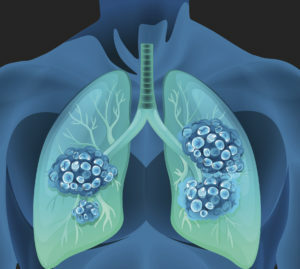 We will work with you to determine the best possible treatment plan for your individual lung cancer case. Some lung tumors need special markers place on your tumor that show up in the imaging process to help CyberKnife pinpoint the tumor’s exact location. If so, these fiducials will be implanted by an interventional radiologist. We will do the simulation procedure a week after the placement of the fiducials. Before your first treatment, you will have a CT scan to find out the exact size, shape and location of the tumor. Other scans might be conducted to help see the tumor and any tissues or organs nearby. After your CT scan, radiation specialists will use the next few days to program your treatment plan into the CyberKnife System including the dose, the area targeted and pointing out any nearby critical organs or tissue, and schedule a visit for you to our conveniently located Southern California outpatient facility. When you arrive for treatment, you will be asked to relax on our comfortable treatment couch, listening to your favorite music, if you like, while CyberKnife’s computer-controlled robotic arm moves around you delivering high doses of radiation from multiple angles and tracking the tumor’s subtle movements to maximize precision and accuracy. The CyberKnife will deliver high doses of pain-free radiation with extreme precision and without any stabilizing, uncomfortable hardware or frames. Unlike traditional radiation treatment types which can last for weeks, CyberKnife treatment is completed in three to five sessions, one short treatment per day, over the course of one or two weeks. Once your treatment is complete each day, you are free to leave our Southern California office and resume your daily activities and tasks as you normally would. Follow-up appointments will then be arranged to make sure that the radiation has produced the desired effect in eliminating cancer cells. Don’t begin your lung cancer treatment without consulting with our radiation oncology experts! They can help evaluate the type and stage of cancer that you have and discuss all of your treatment options with you so that you understand the pros and cons of each. And, your first phone consultation is always free. You can also ask questions or make an appointment online. We look forward to caring for you and showing you how CyberKnife can effectively treat your lung cancer. Call today!